Lucky Raj. This week he gets time on the biggest optical telescope in the world, the Keck Observatory. (Well now second biggest, see comments.) “The Keck” has two telescopes each 10 meters (33 feet) in diameter. A large telescope helps you twice. First of all, a larger area means a bigger bucket with which to catch light from distant objects. The more light you can collect, the fainter objects you can see. Second, it is an inescapable law of optics that the finer detail (resolution) you want see, the bigger the lens (or in this case, curved mirror) diameter must be. That’s the main reason you might use binoculars at a baseball game or opera. There’s plenty of light. But instead of your own quarter-inch pupils you can see more detail using the 1-2 inch lenses of binoculars to create an image you can see in finer detail. What about the Hubble Space Telescope, surely the best telescope in the world? Actually the Keck telescope is better than Hubble in all but one aspect. It is on the ground. Ground-based telescopes have to look through the air between them and space. Most of us are familiar with when looking a great distance, either down from a mountain or across a large body of water, objects on the other side are seen moving around as if they are under water. That distortion is due to rapid changes in the air, called turbulence, which mess up the image you are trying to see. Hubble’s strength is that it is above all the atmospheric turbulence. Still Keck’s astronomers are up to a challenge. They monitor what should be point-like stars and they deform their telescopes’ mirrors within thousandths of a second to undo the atmospheric distortion. They call it “adaptive optics”. Under the right conditions, Keck can use adaptive optics to observe objects better than even the Hubble Space Telescope. The best ground-based telescopes are located on tops of mountains to be above as much of the atmosphere as possible, or at least in locations with very stable atmosphere. Astronomers say such locations have “good seeing”. 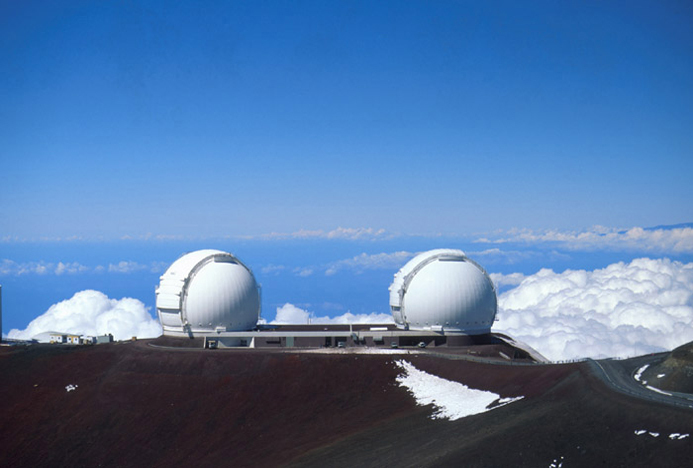 The Keck telescopes are located atop Mauna Kea, the highest point in Hawaii, at almost 14,000 feet elevation. So lucky Raj, not only does he get time on the biggest optical telescope in the world, he gets to go to Hawaii, right? Not so fast. He only went down the hall. Professional operators point the telescopes. Modern astronomers don’t look through an eye-piece anyway, they record images with digital cameras. They receive images over the internet. So Raj just went down the hall, to a dingy little conference room with a bunch of computers. (Did anybody notice what email client Raj still uses?) If you are interested in becoming an astronomer don’t despair. Students and faculty still sometimes do go to Hawaii, or even Chile, to observe. Modern astronomers don't look through eye pieces. They record images with digital cameras. Raj had something exciting to do tonight, looking for planets in a stellar system outside our own. Also called extrasolar planets or exoplanets, astronomers’ instruments are actually sensitive enough to find planets orbiting other stars. But generally not by direct imaging. The nearby star is too bright and the planet is almost always too dim. In Raj’s case he was looking for a star passing in front of the star Epsilon Eridani, a star from Sheldon’s song. Imagine you were an extra-terrestrial watching our own Earth go around the Sun from another stellar system. Our Earth has a diameter about 1/100-th the size of the Sun. So a distant observer around another star could hardly see the little bit of light reflected by the Earth from the Sun compared to the enormously bright Sun itself. But if you, the alien observer, are in just the right place, sometimes the Earth will pass between us and the S It makes a kind of tiny eclipse called a “transit”. Because area goes as the square un. of the diameter, our Earth would block out 1/10,000-th of the Sun’s brightness. A sensitive enough measurement would see its transit in principle. Observers in our stellar neighborhood would see this dimming for at most a few hours, but regularly every year. Jupiter would be much easier, it would block a full 1% of the Sun’s intensity, although only once every twelve years, the time it takes Jupiter to orbit the Sun. 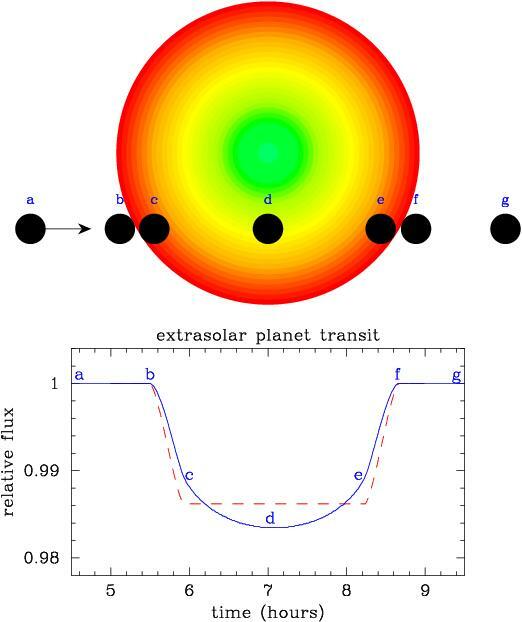 During a "transit", an extra-solar planet passes in front of a star, dimming it ever-so-slightly ever-so-briefly. The "Doppler Effect" precisely measures the motion of stars, which changes as their own planets pull on them. Want to find more exoplanets? There’s an app for that. The iPhone has a (free) exoplanet app. It beeps every time a new extra-solar planet has been discovered. (And besides, the app has really cool animations.) So far, it is easiest to find the largest, Jupiter-sized, planets, which are closest to their host star. But as the technique improves astronomers will find smaller and smaller planets. We have not yet found a planet at the right size and distance to host water on an Earth-like surface. But it may come soon. The Kepler satellite uses the same technique as Raj, but using a space telescope so it is even more sensitive. I would not be surprised if they announce an Earth-like neighbor within the next year or so. Astronomers know of over 500 exo-solar planets to date. Since the technique only finds really large ones so far, they are safe from Drs. Tyson and Brown. We preempt tonight’s science to bring to you breaking news about last week’s science. Astronomers just announced Eris may be smaller than Pluto. Pluto and Eris are dwarf planets that orbit the Sun in the Kuiper Belt. Eris is a dwarf planet discovered only within the last ten years. Along with Pluto, it orbits the Sun in the Kuiper Belt, at over 30 times the Earth’s distance to the Sun. But Eris’s discovery was a day of reckoning. Eris was larger than Pluto. How embarrassing. How could Pluto be a planet, so the public argument went, if an even larger body was not? It was a simple and persuasive argument. Certainly easier to explain than the full reason for demoting Pluto: that some planet-like objects like Pluto are different than the eight solar planets since they don’t clear their orbits. Eris was larger than Pluto–what could be more direct. 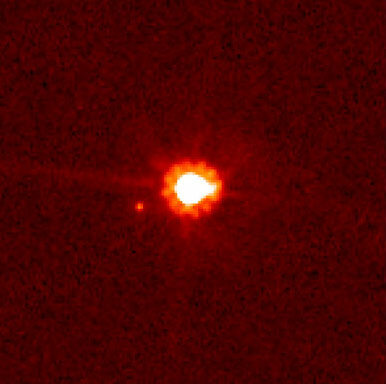 Up until now, the size of Eris was estimated by a number of techniques. One way was from its mass. Its mass is measured from the time it takes for its moon, Dysnomia, to complete its orbit. The larger the mass of the central body, the faster its moons will orbit it. (Mathematically, the duration of the orbit of a small body around a large, central one goes inversely with the square root of the mass of the central body.) For example, if Earth were four times as massive, our own moon, Luna, would orbit us in just 14 days. That is, the gravitational force on the Moon from the Earth would be four times as strong and the only way the Moon could travel in a circle around us at its current distance would be to increase its speed by a factor of two. We’d have 24 months to remember. Then, assuming we counted months properly, it would be Christmas in Vigintiquattuorber. Eris is orbited by its moon Dysnomia. The period of orbit tells us Eris's mass, but not its size. So anyone can compare the mass of Pluto to the mass of Eris and determine which is physically larger right? Wrong. That’s only if you know the two objects have the same density. To measure the physical size of an object you need to do something geometrical. A few techniques: extracting the cross section from its brightness and even direct imaging gave some results, but up until now with significant experimental uncertainty. The experimental uncertainties were always such that Eris could have been smaller than Pluto, but it just looked like that would be unlikely. A special astronomical event changed all this. One of the most useful moments in astronomy is when an object passes in front of a star. This event is known as a occultation, and can be thought of as a kind of eclipse. Occultation and eclipse are not exactly the same thing. In an “occultation” the nearer body completely covers the farther one–in this case Eris passing in front of a star in the constellation Cetus. Distant stars appear point-like to us. An “eclipse” can be an occultation but also when a body passes into the shadow of another is a completely different kind of event also called “eclipse”. Sometimes the nearer body does not completely obscure the body behind it, in what is called a “transit”. Too many things to remember? Just tell your friends it is a “syzygy”. Stars occupy such a small angle on the sky that predicting these events are hard, but astronomers are up to the task. Eris is so small that its shadow is much smaller than the size of the Earth. Astronomers had to predict which spots on Earth had the best chance and a few found it. When Eris passed in front of a dim star in the constellation Cetus, astronomers measured exactly how long the star was blotted out. The larger Eris is, the longer the star disappears from the sky. A telescope in Chile found it dim for 76 seconds. A few other measurements at other telescopes yielded Eris’s diameter. And to everyone’s surprise, Eris was smaller than its mass suggested. (Actually this was within the range of experimental uncertainties of the previous measurements.) It is a physically smaller, more compact object than Pluto. For a wonderful account of this observation made by one of the discoverers of Eris, see Mike Brown’s blog about the event, which is where I found most of my information. Dr. Tyson should come back. And he should bring Dr. Brown with him. 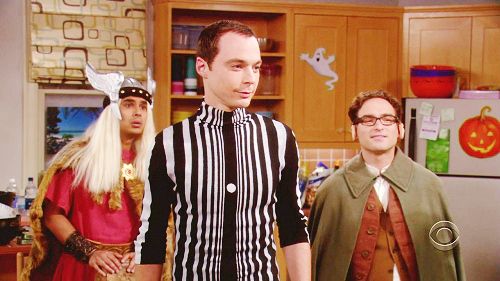 I suspect Sheldon needs to have a word with them. Tonight’s show had a special guest star, Dr. Neil deGrasse Tyson, Director of the Hayden Planetarium in New York City. As we learned from Sheldon, Dr. Tyson was instrumental in defining a new class of solar system object, the “dwarf planet” — and then demoting Pluto into it. 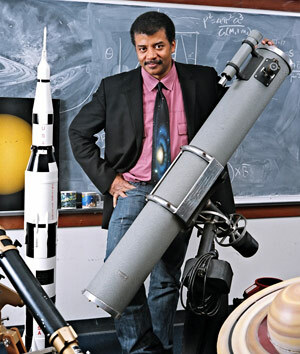 Dr. Neil deGrasse Tyson, astrophysicist, guest starred on tonight's show as Dr. Neil deGrasse Tyson. 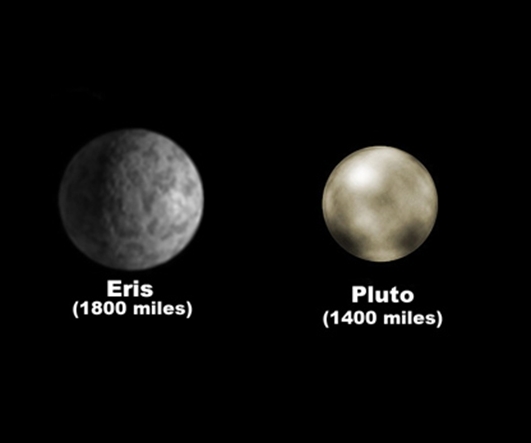 Several objects nearly the same size as Pluto share approximately the same orbit, one even larger. If Pluto is a planet, then so must be the other five or so large round blobs orbiting our Sun (that aren’t moons). Up until a few years ago you could recall their names in order with a simple mnemonic: “My Very Elegant Mother Just Served us Nine Pizzas” (for Mercury, Venus, Earth, Mars, Jupiter, Saturn, Uranus, Neptune, and Pluto). Eris is bigger than Pluto and orbits the Sun at nearly the same distance. But it was never called a planet. But as Dr. Tyson points out at the Hayden, let us not simply count planets. More important, the planets seem to fall into different classes. The first four are small and rocky with iron cores, typically called the terrestrial planets. The next four are the gas giants. Having two different types of planets is not accidental. As the solar system formed out of a blob of gas about 5 billion years ago, the innermost material was much hotter due to the proximity of the Sun. So small dusty and metallic grains could form and coalesce, but nothing that would be gaseous. Only out around the distance of Jupiter and beyond was it cool enough that methane and water would crystallize into ice and coalesce into the gas-giant planets. At least so goes the theory. We can’t watch our own solar system being formed. But over the last two decades we started taking actual data, because we have the ability to observe planets around other stars. We are now on the verge of being able to measure the actual distribution of terrestrial and gas-giant planets around many different stars. We’ll see what the data tell us. We would probably have a fifth rocky planet but the constant gravitational influence of Jupiter as it orbits the Sun keeps the material beyond Mars from coming together and instead we find the Asteroid Belt. Some are still large enough to forms spheres under the influence of their own gravity, such as the asteroid Ceres. Ultimately the definition of a planet included the new criterion that it have mostly cleared its orbit of other material. 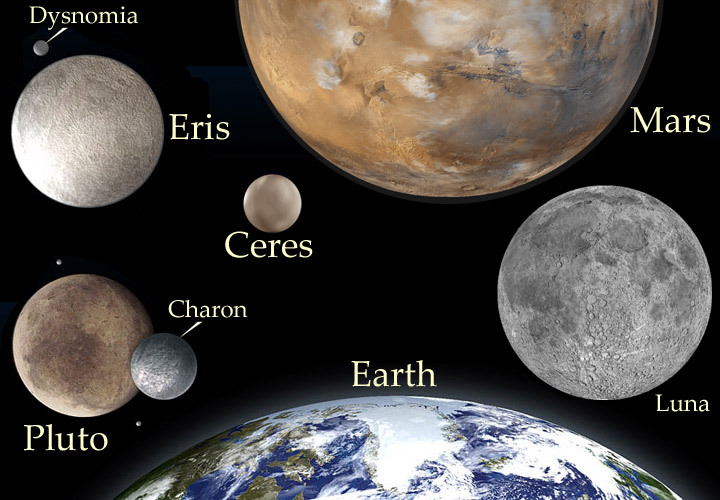 Ceres and Eris fail. And so too went Pluto. Would we have called Ceres a planet too? (windows2universe.org) Do definitions really matter? Beyond Neptune we find a different kind of objects. Out near Pluto are thousands of objects composed of rock and ice. Their composition is similar to that of comets. And it is no surprise. That is where many of the short period comets (say 50-200 year orbits) originate from. These objects form a third type of object, beyond the terrestrial planets and the gas-giant planets and form what is called the Kuiper Belt, a large collection of objects that also orbit the Sun in roughly the same plane as all the planets. These are some of the objects of Raj’s research in previous seasons, “Trans-Neptunian Objects”. I think having the public ruckus over Pluto was good for science. After all, we showed our benefactors that our ideas are not written in stone. We demonstrated a hallmark of science, that when a better idea comes along we are willing to change our definitions and theories. Let’s start with “planetary nebulae”. A nebula is the word that astronomers give to any cloud-like object that astronomers find. So far so good. Astronomers long ago found some of them around of stars. At the time, astronomers thought that this was the gas and debris that lay in a planetary disk, hence the name. Astronomers now know, that these nebula are actually formed by stars in their death throes. Gas is thrown off as the star ends its life. It has nothing to do with forming planets. As long as astronomers are keen to fix up the definition of planet, why not fix up “planetary nebula” to something else as well? 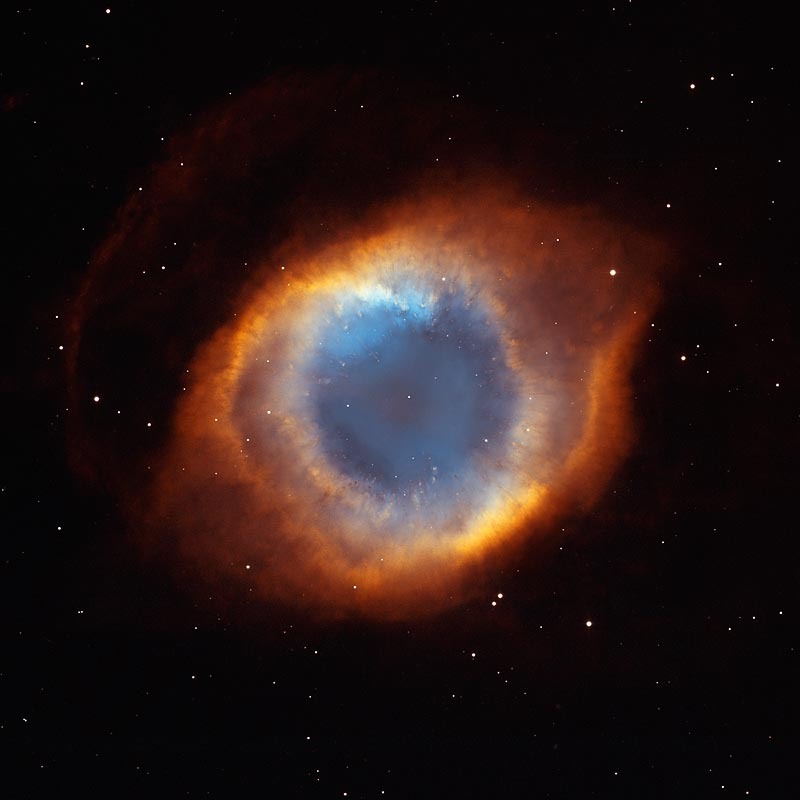 The "helix nebula" is a cloud of gas puffed out by a star 700 light years away and is an example of a "planetary nebula". If you look carefully you can find it on the wall in Leonard & Sheldon's apartment. Another pain left over from 2000-year old astronomy is the classification of the intensity of the stars in our sky, called apparent magnitude. Now you might think that a larger magnitude is brighter, but you’d be wrong. That’s backwards. Fine, we can live with a minus sign. The dimmest star you can see with your naked eye is 6. The star Vega was chosen as the calibration point, 0. Well actually Vega is magnitude -0.03. But why change the scale? Ever? Once per 2000 years? No. Was Vega chosen because it was the brightest star in the sky? That would be sensible. Well close. It is fifth brightest. It was the first star to be photographed, however, and that set the scale forever after. To make matters worse, take a look at magnitude quantitatively. Out here in California, we are used to talking about Richter scale for magnitudes of earthquakes. And it is pretty simple. A “magnitude 6” earthquake is about 10 times the shaking as a magnitude 5 quake. A quake with magnitude 7 is 100 times more shaking than 5. That’s a good way to measure when the distributions vary so widely. It is called a logarithmic scale, or ratio scale. So is a magnitude=5 star 10 times as dim as a magnitude=4? No. What is it then? A factor of 2.5119. Why? Because that’s the fifth root of 100. Ask a silly question, you’ll get a silly answer. This scale is left to us from the Ancient Greeks. There’s nothing wrong with it, but it does make teaching it to non-science majors needlessly difficult. Stars can classified by their surface temperature. From hottest to coolest they are tagged with letters. By now, you are not expecting A,B,C,D,…. Right. It is O,B,A,F,G,K,M. It is a relic of a previous attempt to classify stars based on the strength of the absorption of light by hydrogen. It is easy to remember though: “Oh, Be a Fine Girl (Guy), Kiss Me!”. At least the reclassification of Pluto is progress. Astronomy will be around at least another 2000 years to slowly fix the others. From now on we only need concern ourselves with “My Very Elegant Mother Just Served Us Nachos”.